Alternative Part Numbers Include X80927001, XE1679201, BLG-WF, XE1678201, XC2214002 (XC2214-002), A9811E600A0 (A9811-E60-0A0), A9150E800A0 (A9150-E80-0A0), 214875014, 200310002, 395719-55, 395719-26, XA8320-101 & SA140. Walking Foot for all 7mm Zigzag Brother and other low shank screw on presser bar systems. May require low shank adaptor for some Brother PC and ULT models. For dependable feeding of multiple layers or fabrics through the interaction of upper and lower feed dogs. *The adpater for low shank attachments is required for use on PC-8200 and PC8500. The walking foot is a moving feed system that holds and moves fabric between the presser foot's upper feed dog and the machines's lower feed dogs to better control difficult fabrics as well as multiple layers of fabric. 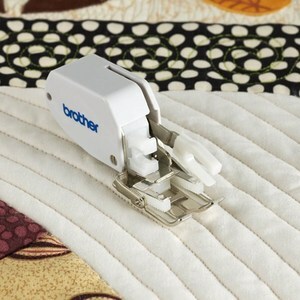 The walking foot is great for quilting, sewing when matching prints or plaids or fabric drift is an issue. Brother® offers several Walking Feet which differ in the size of the feed dog, shank height etc. Please check your manual or the machine listings on this website to find the correct Walking Foot to fit your machine. Walking Feet are not for use in reverse or side to side sewing as well as some built in stitches that include other than forward movement of the feed dogs. BL16, BL18, BL18A, BL20A, BL22, BL23, BL23A, BL30A, BL40, BL66, BL67, BL137A, BL137A2, BL200A, BL7500, BL7800, BL8000, BL8500, BL9500, BLCC, BLCC2, BLDC, BLDC2, BLG, BLG2, BLL, BLL2, BLN, BLSO, BLQC, BLQC2, BLMY, BLR, BLR2, BLR3, BLSR, BLSY, BLTP, ESI, ESI2, ESE, ESE2, ESG, ESG2, ESG3, ESL, ESN, ESP & INT. BC-1000, CE-4000, CE-5000PRW, CS-100T, CS-770, CS-4000, CS-5055PRW, CS6000, CS-6000t, CS-6000i, CS-8072, Duetta 4500D, ES-2000, EX-660, HE-120, HE-240, HS-1000, Innov-Ã­s 40, Innov-Ã­s 80, Innov-Ã­s 900D, Innov-Ã­s 1000, Innov-Ã­s 1500D, Innov-Ã­s 1200, Innov-Ã­s 1250D, Innov-Ã­s 2500D, Innov-Ã­s 2800D, Innov-Ã­s 4000D, LB6770 PRW, LB68000 PRW, NX-200, NX-250, NX-400, NX-400Q, NX-450, NX-450Q, NX-600, NX-650Q, PC-210, PC-210PRW, PC-420, PC-420PRW, PC-2800, PC-3000, PC-4000, PC-5000, PC-6000, PC-6500, PC-7000, PC-7500, PC-8200, PC-8500D, PS-2200, PS-2300, PS-2500, PC-8500, QC-1000, SE-270D, SE-350, SC-8060, SQ-9000, SQ-9050, ULT2001, ULT2002D, ULT2003D, XR-6600, VX1435 and XR-7700. 2100, 2110, 2130, 2300, 2600, 2800, 3210, 3230, 5100, 6001, 6003, 6004, 6005, 6200, 6600, 7200, 8600, 9500, Q6600 & Sew Fun. HZL-E61, HZL-E70, HZL-E71 and HZL-E80. 7463, 7469, 7469Q, 8763 and SES-1000. 207, 215, 219, 224, E10, E20, C10 and C20. Very satisfied. And will use again. You had just what I wanted at a good price & I received it quickly. Awesome! I have referred your site to other seamstresses already. I am sooooo pleased with the Brother SA140 Walking Foot that I purchased from you. I decided to look online for it after seeing how expensive the same foot was a local store in the Twin Cities. Purchasing it from AllBrands saved me $30 and there was no shipping charge!!! I could not be happier. Thank you so much! I'm very happy with the ease of ordering, great selection of products, and the speed of delivery. I will definitely order again in the future as there are other items I will be needing for my sewing projects. I was very happy with the service and I thank you for the dedication to having good service. I was so glad to find the Brother sewing foot and did not have to look very hard for the proper walking foot. I am amazed and Love my SA552. The items I orderd arrived in 2 days to California. I could not believe how efficient your company is. I will buy other items from your company. YOur phone operators are exetremly helpful too. Thanks! I am so glad I found your website. I am very satisfied with your service and products and will use your company again. I am so impressed with your selection, pricing and service. You had exactly what I needed, at a fantastic price and I received it in three days! You'll be hearing from me again! Thanks! thank you so much. i am learning to quilt and the walking foot was over $10 more through a dealer in my city. the free shipping was an added bonus as well. i received it two days after ordering. i think it was the fastest shipment i have ever personally ordered. and it works great! thank you again. i will visit your website for any other sewing machine attachments that i may need in the future. I'm very impressed with your company and will not hesitate to do business with you again. Thank you! I am sure that the quality is great as well. I have not seen it yet. I ordered for my mother and we won't get to work with it until I go home for Christmas. Wonderful website that I will use in the future. As soon as my budget allows I will order another Brother SA129 free motion foot for myself. Thanks so much!! Recieved what I ordered, promptly, for a fair price, will order again from All Brands.